Braskem, SA is the largest chemical and petrochemical company in South America. It produces thermoplastic resins: polyvinyl chloride (PVC), polyethylene, and polypropylene, which are the base ingredients for a large number of fibers and plastic materials. Braskem also manufactures aromatic and intermediate chemicals used in the production of nylons and other substances. Braskem was founded in 2002 and is headquartered in Sao Paulo, Brazil. Braskem has a total of 36 industrial facilities, 29 in Brazil, two in Germany and five in the United States serving a client base that spans 70 countries around the world. Its top competitors are BASF and Exxon Mobile Corp.
Braskem evolved from Odebrecht, a multinational Brazilian construction company. In 1979, Odebrecht joined the petrochemical industry. In 1987 Odebrecht Quimica was formed to handle the investments of the parent group. By this time, Odebrecht was already involved in polyolefins and soda chlorine production. Braskem was born in 2002, following the integration of a collection of Odebrecht acquisitions and expansions, immediately propelling to the forefront of the Latin American petrochemical industry. Shares were sold on the Sao Paulo and New York stock exchanges. Braskem SA operates through four production divisions: (1) Petrochemicals Unit, (2) Vinyls and Chemicals, (3) Polyolefins, (4) Chemicals distribution, and (5) United States and Europe. The Petrochemicals unit also supplies compressed air, electric energy and steam to other petrochemical plants in South America. The Vinyls and chemicals unit produces caustic soda, PVC and chloride. The Polyolefins unit is involved in the production of polyethylene and polypropylene for domestic and international markets. The Chemicals Distribution unit is responsible for distributing intermediate and specialty chemicals, petroleum-based solvents and pharmacons to Braskem’s customer base around the globe. 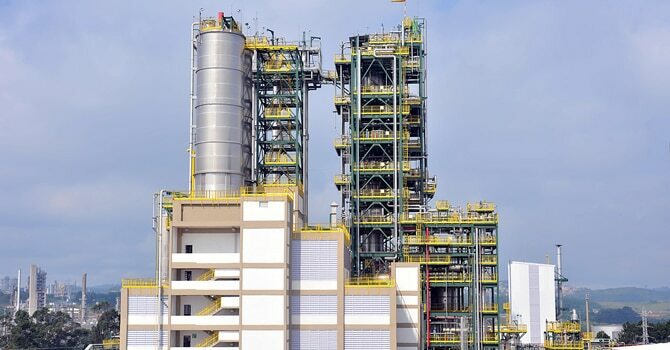 The United States and Europe unit is involved with polypropylene production through its American subsidiary, Braskem America and German subsidiary, Braskem Alemanha. Braskem provides financial and technical support to a wide variety of community-based initiatives involved in education, technology advancement, sports and culture. In partnership with other agencies, Braskem seeks to bring a heightened awareness and knowledge among Brazil’s future corporate leaders, innovators and workers of the importance of preserving delicate ecosystems, especially water supplies. It provides special programs that teach community leaders, teachers and students how to engage in sustainable consumption. Additionally, Braskem supports local theater productions, art exhibits, the symphony and unique programs that formulate constructive dialogue and understanding between cultures. In 2007, Braskem became first company in the world to develop green plastic—polyethylene from sugarcane ethanol. 80 percent of the energy utilized to produce the polyethylene comes from renewable sources. In 2014, Braskem was named by “Fast Company”, an American business magazine as one of the 50 most innovative companies in the world. Also in 2014, Braskem announced the construction of a new, high-tech, resins and polyethylene factory in the United States.